Lois "Betty" Powell, 91, of David City, died Tuesday, March 20, 2018, at the Butler County Healthcare Center in David City. Funeral Service Saturday, March 24, 2018 10:30 A.M.
Lois Powell was born February 22, 1927, in David City to Arthur and Ida (Hickstein) Grubaugh. She attended school in Rising City, graduated from Normal Training in Shelby and taught school west of the 7 Mile Inn for one year. She went to work at Bernt's Café and on February 10, 1946, married David Powell in David City. They lived in Ulysses, moved to Oregon in 1956, returned to Ulysses and in 1961, moved to David City. Betty worked at Ida's Café and Shop EZ in David City. She enjoyed spending time with family . 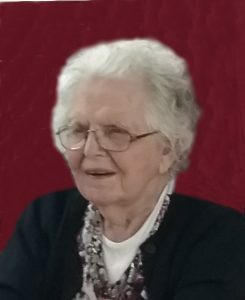 She is survived by three sons; Rodney Powell of Syracuse, Douglas (Jeannette) Powell of Denton and Jeffrey (Rita) Powell of Salt Lake City, a sister, Doris Stoll of David City, one brother, Gene (Margaret) Grubaugh of David City, 8 grandchildren, 14 great-grandchildren and one great-great grandchild. She was preceded in death by her parents, husband, daughter-in-law Anna Mae Powell, granddaughter Jane Catherine Powell, two sisters; Lenora Alt, Barbara Kastl and a brother, Robert Grubaugh.